During a news conference on Friday afternoon at Minute Maid Park, Astros Game 4 starter Charlie Morton was asked how pitching in a World Series will change the way he looks back on his career. His answer was rather matter-of-fact. "I think it will change it exactly how you described it: I'll have pitched in the World Series," said Morton, who will oppose Dodgers lefty Alex Wood after the Astros won Game 3, 5-3, to take a 2-1 lead in the Fall Classic. "Somebody asked me if they thought the Game 7 [in the American League Championship Series] that I threw would really change my career. And I think so, but it wouldn't put my career in a different trajectory. And I don't think pitching in the World Series would necessarily put my career in a different trajectory, good or bad." Morton, now 33, remembers when that trajectory began, the day he thought he might make it -- at least somewhere -- as a pitcher. It was 2001. Morton was a junior at tiny Joel Barlow High School in Redding, Conn., and his team was on the road, 15 miles up Route 84 at rival Brookfield High. His opponent that day was a lefty named Tim Rice, Brookfield's ace. "I knew there were a few scouts there for Tim," Morton said. "After the game, I got a card from [scout] Charlie Sullivan from the Pirates. That was when I started to think I could go to college, get a scholarship. Shoot, maybe I could even get drafted." Barlow athletic director Michael Santangeli, who was the assistant baseball coach back then, also remembers that day. "Rice was highly thought of, and there were two scouts there, from the Pirates and the Red Sox," Santangeli said. "In the top half of the inning, Tim throws and retires the side. Then, here comes Charlie. He starts to throw, and you see those scouts raise up those guns, because they could tell that he had a really live arm. Next thing you know, every game Charlie pitched his senior year, down the right-field line at Barlow, there were 20 or 30 scouts with guns watching his every pitch." Morton was Barlow's ace from 1999-2002. He could touch 90 mph with his fastball at the start of his freshman year and also wielded an off-the-table curveball (sound familiar?) and a sinker. "Charlie's freshman year, I was still the JV coach," Santangeli said. "The first time I saw him pitch before his freshman year, he was throwing very, very hard. The varsity coach looked at me and said, 'Mike, you're not going to see him at all, he's going to be with me.'" Morton's grandfather, Bob Pfeilsticker, played in the Philadelphia Athletics' organization. His father, Chip Morton, who was a basketball player at Penn State University, and his mother, Jeanne, were also completely dedicated to their son's baseball career. "I remember my mom throwing batting practice to me when I was playing [American] Legion ball," Morton said. "My dad bought painters' lights, and it'd be dark out when he got home from work, and he'd put the lights on and catch me." The elder Morton even built a mound and a batting cage in the family's basement. "Charlie was completely dedicated to the sport," Santangeli said. "That, along with his God-given gifts, made him ahead of the curve. By the time he was a ninth-grader, he was definitely capable of getting varsity batters out. He was a mature thinker on the mound, he understood how to approach hitters from that early age, and that was because he just played a lot of baseball." 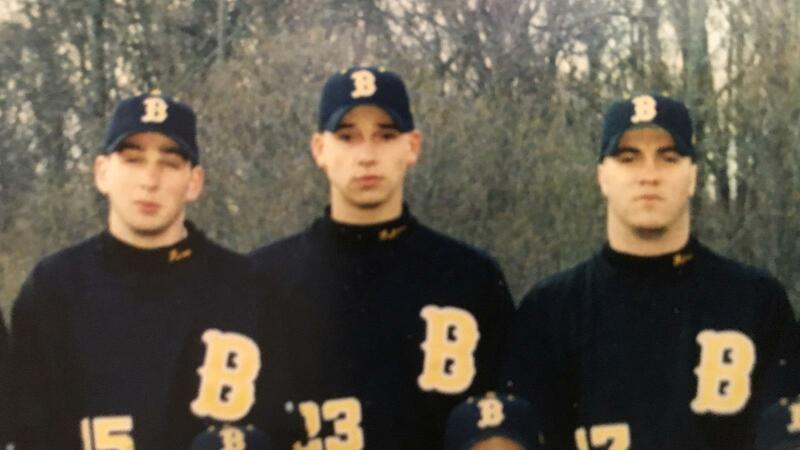 Photo: Charlie Morton (middle) poses with high school baseball teammates. And since then, Santangeli and all the baseball players at Barlow have followed Morton's career -- from a trade to the Pirates in 2009, followed by a one-year pit stop with the Phillies before signing with the Astros as a free agent last offseason. He finished 14-7 with a 3.62 ERA over 25 regular-season starts. Morton's journey came to a head last Saturday night, when he took the mound for Game 7 of the ALCS against the Yankees. Morton, who was born in New Jersey and lived there for several years before moving to Connecticut, was a Yankees fan as a kid; his father was a lifelong Yankees fan from Long Island who often took him to their games. Nearly everyone in the southern part of Connecticut, including Santangeli, also pulls for the pinstripes. "I was rooting for the Yankees in every game, period," Santangeli said. "That being said, I wanted Charlie to do really, really well." And Morton did. He went five scoreless innings, giving up only two hits. Morton offered some perspective when he reflected on that game a few days later. "I can remember the first time I pitched at Wrigley, and I gave up 10 runs in an inning," Morton said on Friday. "And I'll look back on that and it's part of a career. It's part of a journey. And the highs and lows are what make it great, not just the highs. If anything, the lows make you appreciate it more. They make you a better person. They make you a better pitcher, a better professional in general." Added Santangeli: "To see him rise to that occasion in Game 7 was amazing to me, and when the game was over, I looked at my wife, and I said, 'I'm still so happy.' It was like I couldn't lose that night." Saturday night in Houston, the Astros' faithful will do their best to make sure Morton feels like he can't lose at Minute Maid Park. "In terms of square footage or surface area, it's small," Morton said of his home field. "The lid is closed. You know, it gets loud. It gets real loud. But for me, that's awesome, because it feels like the whole city is behind me." All of Houston, and all of tiny Joel Barlow High School in Redding, Conn.